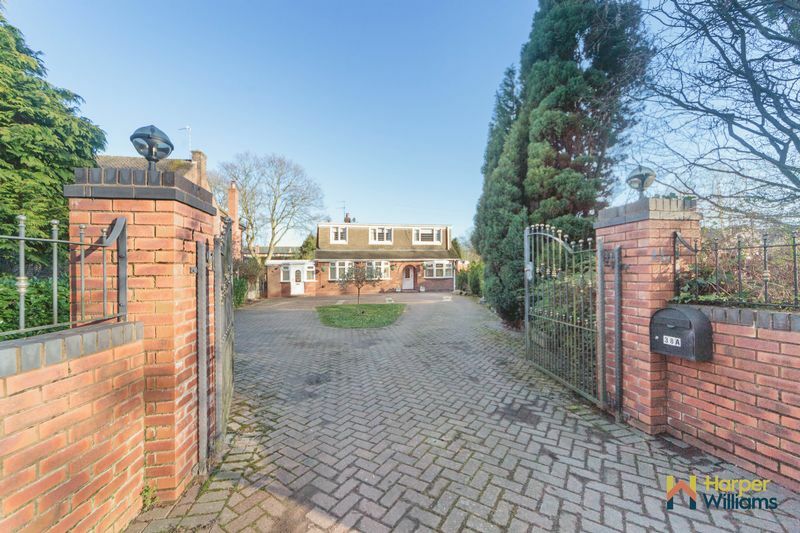 An exciting opportunity to purchase this extensive detached property which occupies not only a substantial footprint but is nestled within a stunning plot along the ever-prestigious Hob Hey Lane, with a gated entrance. 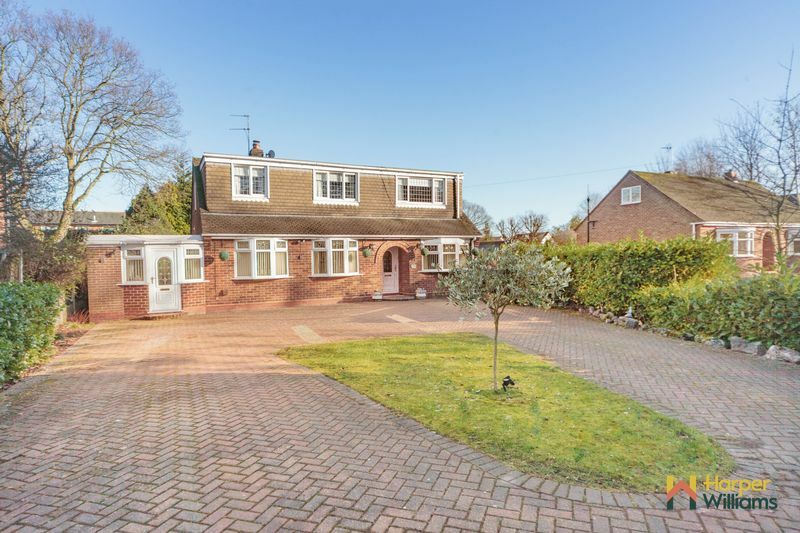 Set back from the road down a long block paved driveway with a feature turning circle, this detached family home offers complete privacy and spacious accommodation throughout with a generous sunny aspect garden to the rear, perfect for enjoying those summer days and evenings! 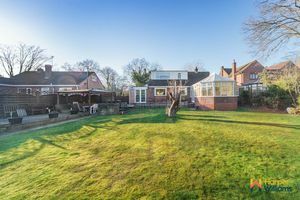 The property also offers fantastic scope for buyers looking for a prime plot to either self-build or extend and re-design to their own liking, subject to all the usual planning and building consents. Currently the accommodation offers generous family living space by way of a welcoming entrance hall, open plan lounge/ sitting room, dining room which flows open plan into the contemporary breakfast kitchen, large conservatory, family bathroom and a separate home office to the ground floor. 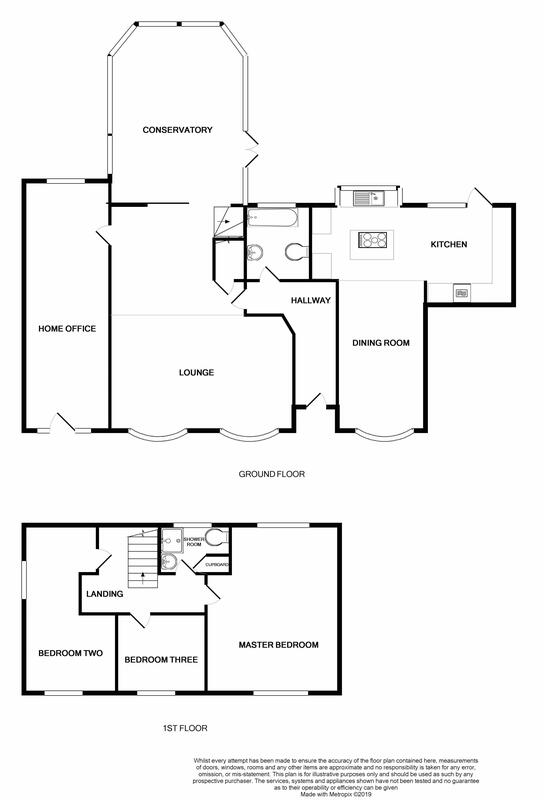 To the first floor, there are three bedrooms (two doubles) and an additional shower room. 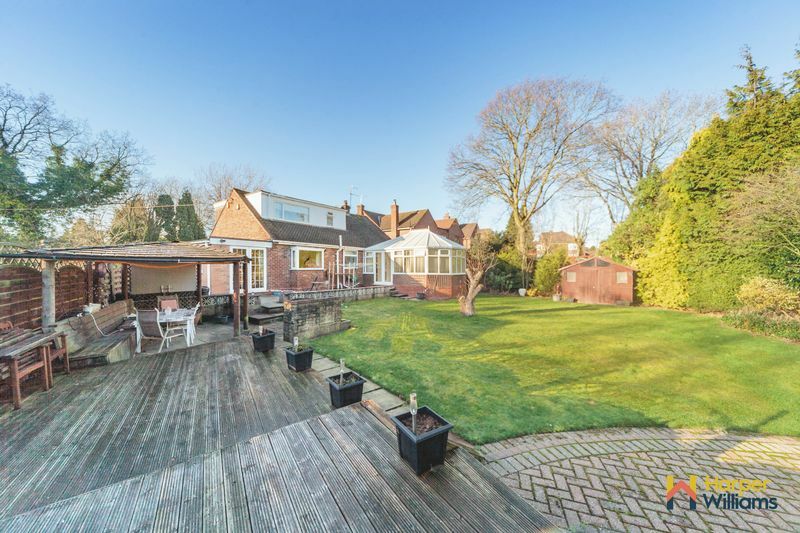 Externally the property boasts an imposing frontage, providing plenty of secure off road parking and to the rear there is a larger than average private garden which is not overlooked, sunny aspect and boasts fabulous patio and decked areas, ideal for outside entertainment/ enjoyment. Offered for sale with no upward chain, early viewings are highly advised. A welcoming light entrance hall via a uPVC entrance door, warmed by central heating radiator, coved ceiling and ceiling light point. 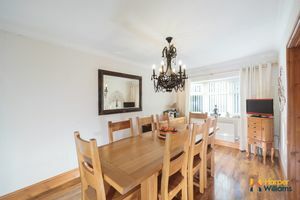 Double opening into the dining room. 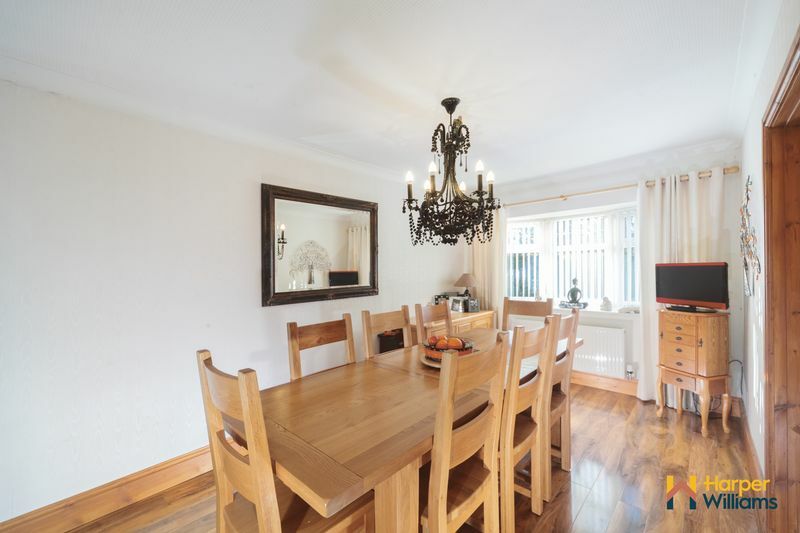 A spacious dining reception room which flows open plan into the kitchen. 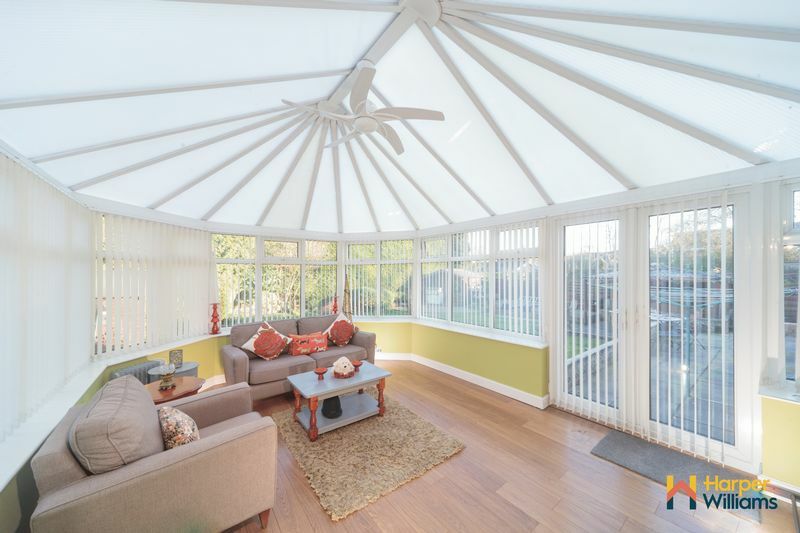 Light and airy with a uPVC double glazed bow window to the front aspect, oak effect laminate flooring, central heating radiator, coved ceiling and ceiling light point. 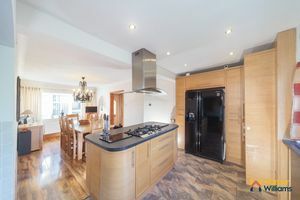 A contemporary kitchen fitted with a range of oak effect and black gloss wall and base units with complementary worktops over incorporating a centre island with a 5-ring gas hob with a stainless steel and glass extractor hood over, integrated ceramic sink with a mixer tap and drainer,integrated washing machine, dishwaher and dryer, space for American fridge/freezer, integrated wine fridge into the centre island, built in oven and grill and integrated microwave. 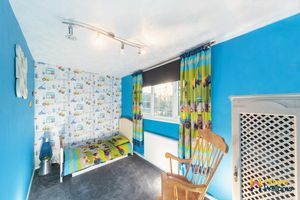 There is a uPVC double glazed box bay window to the rear aspect overlooking the lovely rear garden and uPVC double glazed French doors opening onto the rear garden. Contemporary stone tiled flooring and spotlights complete the look. There is an additional uPVC double glazed window to the side aspect, making this a lovely light and airy room. 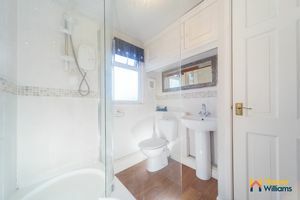 A three-piece suite comprising a panel bath with mixer tap and shower attachment over, low level WC, pedestal wash hand basin and built in storage cupboard. The walls are part tiled in white with contrasting dark slate effect tiled flooring. 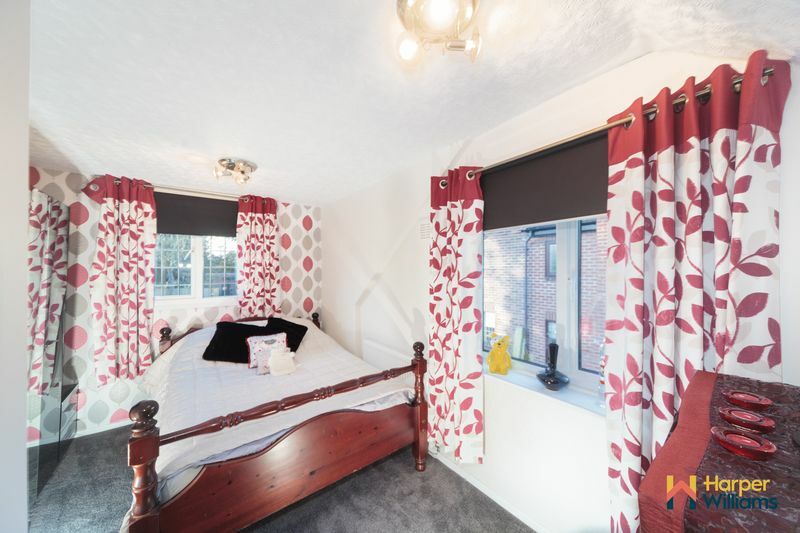 There is a uPVC double glazed frosted window to the rear, central heating radiator and two ceiling light points. 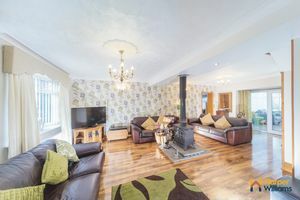 A generous yet cosy reception room with a feature central wood/multi-fuel burner which makes a talking focal point for this impressive room, boasting two uPVC double glazed bow windows to the front aspects, uPVC double glazed sliding doors opening into the conservatory, central heating radiators, coved ceiling and ceiling light point. Gloss oak effect laminate flooring continues throughout from the hallway. Staircase to the first floor. 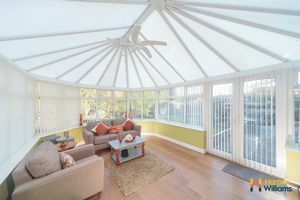 A large conservatory which makes a nice addition to the ground, especially benefiting from a sunny aspect rear garden. There are uPVC double glazed French doors opening onto the garden, wood laminate finish flooring with underfloor heating, two wall lights and central ceiling light/ fan. 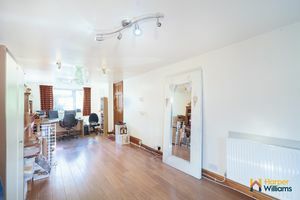 Previously the attached garage, this has been converted into a fantastic home office space which is a great size, but is very versatile and could serve a range of other uses, including a separate annex, home gym, playroom and the rest. 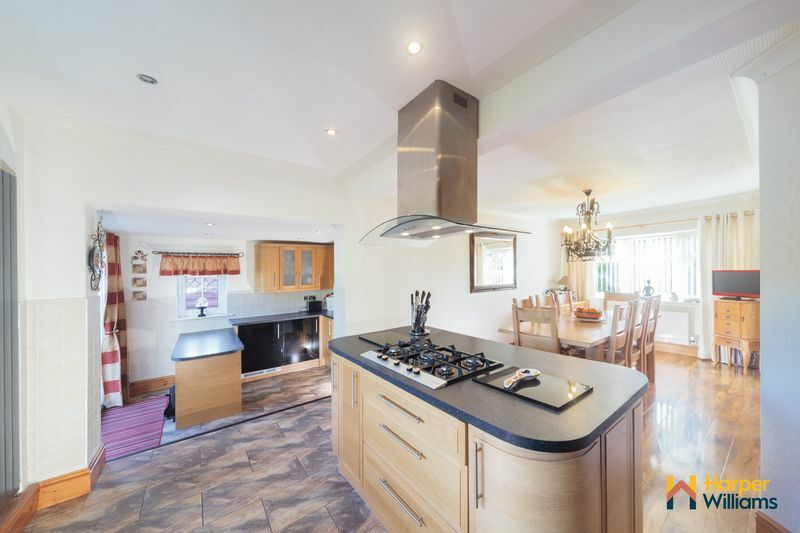 With a uPVC double glazed entrance door to the front and a large uPVC double glazed window to the rear. 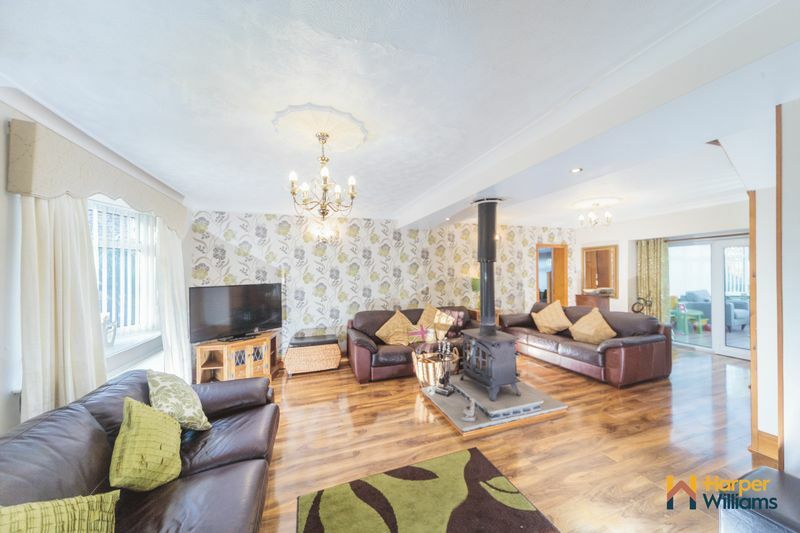 Warmed by two central heating radiators and finished with wood effect laminate flooring. Ceiling light points. 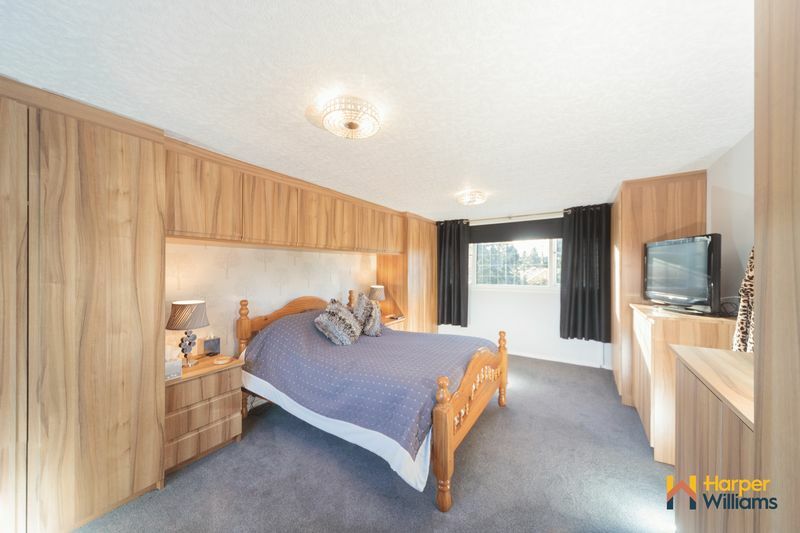 A lovely dual aspect master bedroom with large uPVC double glazed windows overlooking the front and rear aspects. 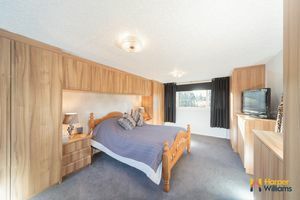 Extensive range of oak effect fitted wardrobes and overhead cupboards and bedside tables, TV point, central heating radiator and ceiling light point. A three-piece suite fitted with a double tiled shower cubicle, low level WC and pedestal wash hand basin. 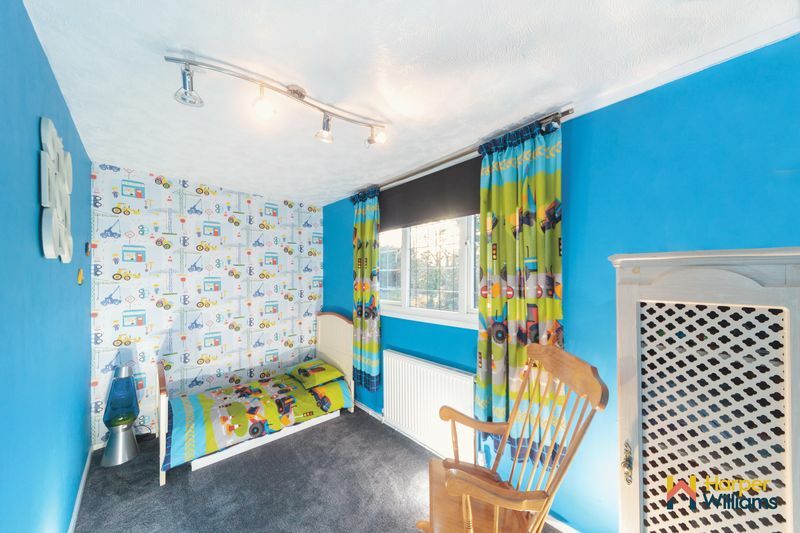 There is a chrome ladder style radiator, built in storage/ airing cupboard, laminate flooring, uPVC double glazed frosted window to the rear aspect and ceiling light point. Another bright and airy dual aspect bedroom with uPVC double glazed windows to the front and side aspects, warmed by central heating radiator and with two ceiling light points. With ceiling light point and eaves storage cupboard. 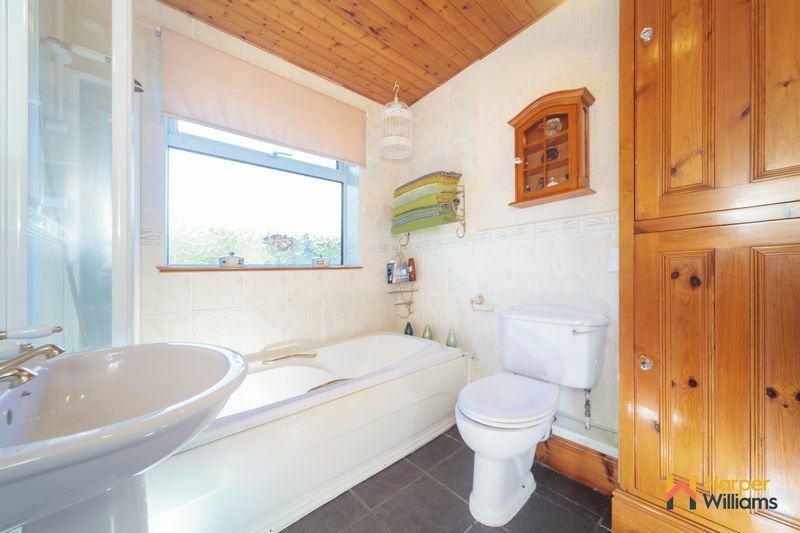 With a uPVC double glazed window to the front aspect, ceiling light point and central heating radiator. Externally the property boasts an imposing frontage, providing plenty of secure off road parking including a turning circle and well-stocked borders to each side. To the rear there is a larger than average private garden which is not overlooked and sunny aspect. 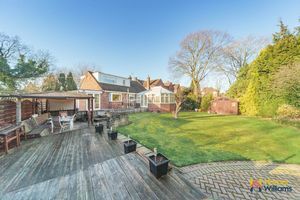 The garden is mainly laid to lawn with mature well stocked trees and borders, and boasts fabulous patio and decked areas with electric points and outside lighting, perfect for outside entertainment/ enjoyment and making the most of those summer days and evenings! The garden also benefits from a fabulous log cabin and garden shed.